Are you excited that #back2school is around the corner? I know my oldest little guy is really looking forward to heading off to senior kindergarten this year! 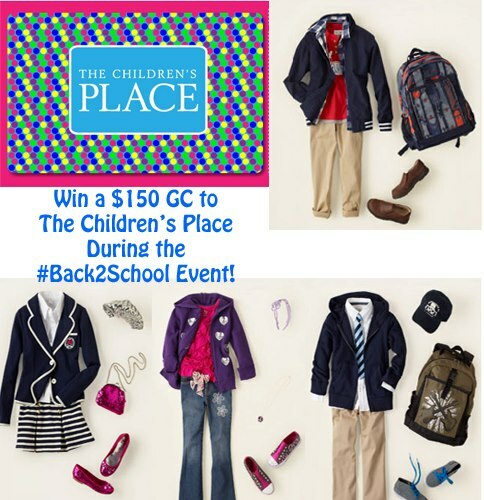 What better way to start the year off by outfitting your child with a $150.00 gift certificate to The Childrens Place? I am joining with a great group of bloggers to help promote this giveaway - it is open to Canada/US and will run from August 17 until 11:59PM August 31! Use the rafflecopter form below to enter, and good luck! Thank you to MySillyMonkeys for organizing this giveaway! There is so much we'd want to get! My daughter needs pants that fit her (long enough and won't fall down). She would love to choose some of her own clothes and I think some rhinestone leggings would be on the top of her list! Both children also need PJs. I would shop the Halloween section - this would be a fun shop. 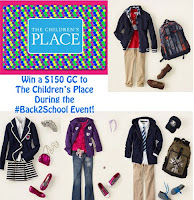 I would love so many things from Children's Place. I'm expecting #2 right now, and their blanket sleepers are awesome. Plus, I love the little tutus and chambray skort for my daughter, and I think I'd top it off with a costume from the Halloween shop. Their costumes are the best!